Man, my Harpy has the same exact issue where the hair meets the shoulder on her left. Those talons were hard to distinguish from the flashing, so I can see how a quick snip turns into an "oh sh*t" moment. Good luck on the paint. 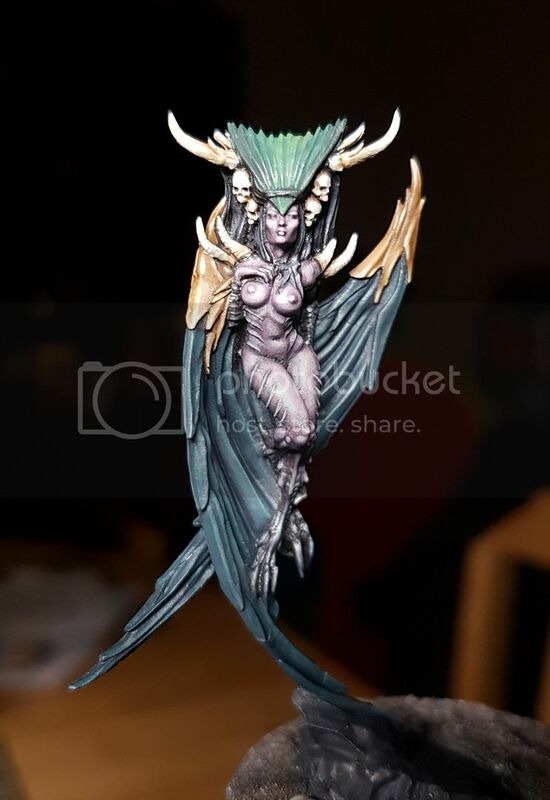 I'll be watching to get some ideas for mine (she and a couple others are sitting in the pile; bathed in primer, and waiting for a brush). Dabeebs so true I didn't even know I'd done it until I stated looking at the rendors from the KS and thought "hang on....". I've actually managed to stick 2 new talons on that I cut from some weapons. The most fiddly, frustrating thing I've done uhh. Looks ok though. I'm not looking forward to trying to sort out the gap in the neck. Mainly because I'm an idiot and just wanted to paint! 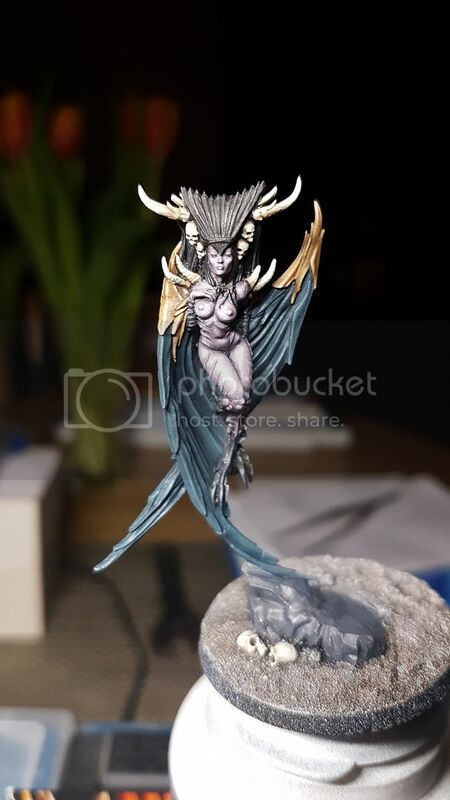 Last edited by Sigmar3; 04-09-2019 at 05:10 PM. I really like the blue tone with the muted bronze/gold...makes it look like some of the art deco stuff from the 30's. I'm thinking I'm just going to slowly fill the gap on her shoulder with layers of glue and maybe bicarbonate, as it's way too small for me to tackle with any sort of putty. What did you end up using to fill the hole? Talons look good. I'm sure it was a PITA to fix such small bits on such a small model. The super thin wing connection to the rock base worries me; last go round with a thin single attachment point left me cropping my Grimhailer's arm about an 1/8th of an inch. Keep it coming! I need some inspiration. lol. Yeah the talons were.....problematic. First I tried using milliput to try and sculpt a couple. Couldn't do it lol. Ended up luckily finding some halbards whose blades were almost perfect. Gluing them on was a bit of a headache but afterwards I was pretty pleased. I just used Vallejos liquid putty to fill the gap, not perfect but better than the hole before. Great save on the talons. I agree 100% with DaBeebs on the look of this color scheme. The art deco look seems appropriate for the Raging Heros world. Heck, I am just impressed you were able to assemble these finicky minis let alone paint them. not thinking about redoing this. Krule I hear you, they are a pain to clean and assemble. I've learnt to accept it basically. They won't be perfect, which is weird because normally I hate stuff like that. Nevermind, bit more work done. This RH Dark Elf looks great! 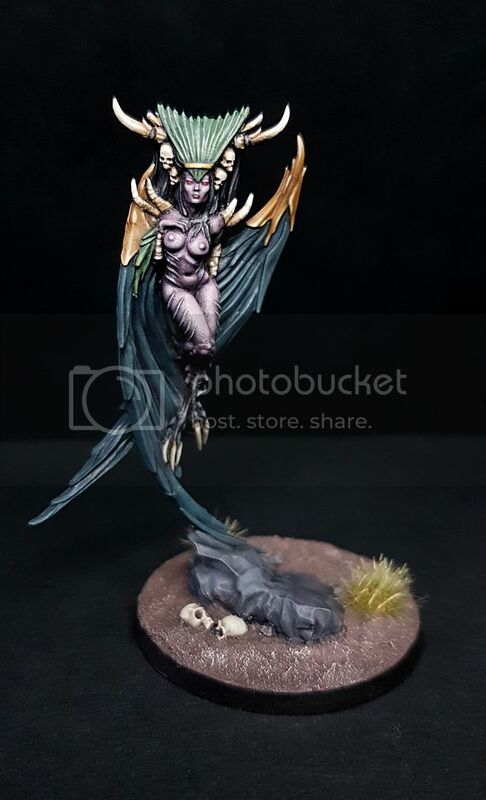 I like the purplish skin tones and the wings look awesome as well. Looking forward to see your next project. Well...what have you got cooking next? 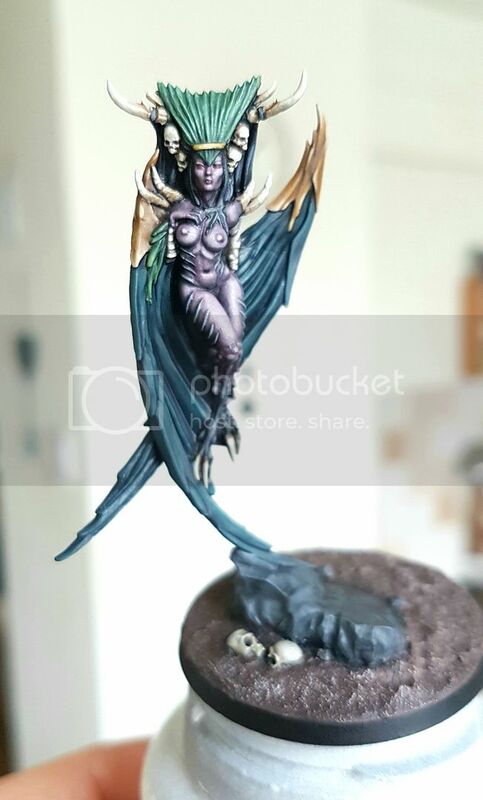 The harpy turned out really good, and I can't give you enough compliments on the color combination for the wings. What colors did you use; I think I'd like to put that recipe down somewhere for a clothing combination on a future project of mine?